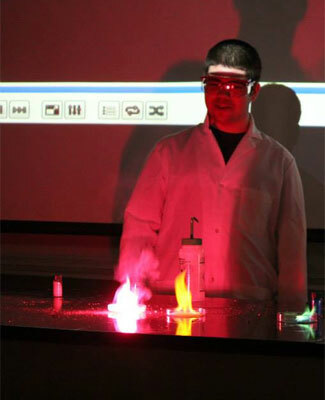 All ages are welcome to attend the FREE annual Chem Demo Night, scheduled for 8 p.m. Friday, April 15, in the Carl Sandburg Auditorium of the Holmes Student Center. The evening conjures up experiments that feature some exciting parts of chemistry – from rapid phase change manipulations to “magically” timed reaction kinetics to luminescence generation. It will include loud bangs; bright flashes of light, fire and heat; and intermittent periods of low light and/or darkness. At the conclusion of the event, the Chem Club will make liquid nitrogen ice cream for everyone to enjoy. Doors open for the event at 7 p.m. Free parking will be available, beginning at 7 p.m. in NIU’s Parking Garage (non‐reserved spots) along the west side of Normal Road across from La Tourette Hall, about one block north of Lincoln Highway (Route 38). For more information, email z1730109@students.niu.edu or ohofst@niu.edu.